Glenury Royal (a.k.a. 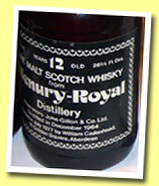 Glenury) was founded by Robert Barclay in 1825 near Stonehaven, south of Aberdeen. That makes it an eastern Highland distillery, just like its 'coastal' neighbours Glenesk, Lochside and North Port. Captain Robert Barclay was a Member of Parliament and he managed to get permission by King William IV to put the world "Royal" in front of the name of the distillery. .... More on Malt Madness.